completely restructure the energy supply. However, we have to lay the foundations today for this extensive restructuring work, which will take generations. To this end, the European Union is subsidizing suitable projects for the European energy sector. One of the latest projects in this restructuring plan is the deep-sea power grid NordLink. This is the name of the first direct power link between Germany and Norway. As from 2020, it should be possible to send 1,400 megawatts of renewable energy through a 623 kilometer-long power line under the North Sea. This is enough energy to supply around 3.6 million German households. While Germany generates this power from wind energy, Norway obtains it from hydropower. Due to the length of the power line, the energy is transferred through the two underwater cables via direct current. There is a converter station at either end of the power line that converts the power into direct or alternating current as required and feeds it to the respective local distribution network. The converter stations are located in Wilster in the province of Schleswig-Holstein, Germany, and in Tonstad, Norway. One of the most important socio-economic advantages of NordLink is that the revenue from the distribution capacities of the interconnector is put to good use. This revenue is used to finance other grid projects or to lower electricity prices. As a result, if for example electricity prices in Germany are higher than in Norway because wind power plants and solar cells do not produce large amounts of electricity, energy from Norwegian hydropower can be imported via the NordLink. Furthermore, the supply guarantee can be strengthened for both grids because surpluses in production can be sold to the other country, respectively. Andritz multi-stage, single-flow, submersible motor pumps are designed particularly for transporting clean or slightly contaminated and abrasive raw water, as well as mineral water, sea water, industrial water, mine water, and cooling water. 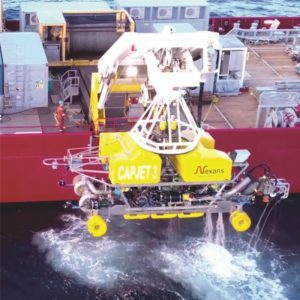 advanced cable and connection solutions for various sectors, such as telecommunication networks, automation, e-mobility or, as in this case, deep-sea power grids. Nexans relies on the Andritz Group’s technology for the pumps needed during installation work. International technology group Andritz has occupied the top spot in development and manufacturing of custom-tailored pump solutions for over 165 years. The submersible pumps for NordLink come from the subsidiary Andritz Ritz GmbH in Schwäbisch-Gmünd, Germany. It has been a part of the Group since 2010 and patented its first submersible pump technology back in 1930. Today, Andritz multi-stage, single-flow, submersible motor pumps are designed particularly for transporting clean or slightly contaminated and abrasive raw water, as well as mineral water, sea water, industrial water, mine water, and cooling water. Depending on their field of application, these pumps are made of cast iron, aluminum bronze, or stainless steel. The pumps require no maintenance, and they have a long service life and high operating reliability. Dredgers are used in order to lay the cables safely on the sea bed. These units are each fitted with two Andritz submersible motor pumps. The pumps are indispensable because they supply the water needed to the various nozzles in the plowshare. This water is sprayed onto the sea bed to soften it so that the cable to be buried can be pressed lightly into it with a roller. The units have been operating to the customer’s full satisfaction since 2017, and Andritz Ritz GmbH has also received orders for spare motors, 11 additional pumps, and a complete set of spare parts. All in all, Andritz has supplied 15 submersible motor pumps to Nexans since the beginning of the project. The second project subsidized by the EU to set up a link between the UK and Norway begins in 2019. Based on the results of an investigation of the potential impact on shipping, fisheries, the environment, the sea bed, and the water quality, the cable link will run from Simadalen in Norway across the North Sea to Long Haven Bay, which is just south of Peterhead in Scotland. Using the same technology and Andritz pumps used for the NordLink, Nexans is laying approximately 665 kilometers of cable. As from 2022, these 1400 megawatts of power will flow through this cable and supply the energy trade between Norway, the UK and the European continent.